Mr. Eibeler is a tenacious advocate of the rights of New Jersey employees. As a plaintiff-side employment lawyer, Mr. Eibeler represents individuals in all aspects of employment law. From the initial consultation through the conclusion of the case, Mr. Eibeler will meticulously prepare the case and the client to best maximize the ultimate desired recovery. Mr. Eibeler’s clients include individuals who have employment legal related issues with their employer and employees who have been unlawfully terminated from their employment. Mr. Eibeler has litigated over one thousand wrongful termination cases including sexual harassment, disability discrimination, FMLA, whistleblower retaliation, age discrimination, race discrimination, hostile work environment and wage and hour. Mr. Eibeler also represents individuals and small businesses in restrictive covenant litigation, including non-competes, unfair competition, non-solicitation and breach of loyalty cases. In addition to his employment law practice, Mr. Eibeler litigates business disputes cases, including complex commercial litigation, shareholder disputes and independent sales representative commission matters. Prior to and while attending law school, Mr. Eibeler was a sale representative for several national hardware companies which has provided him a unique understanding of the rights of sales professionals to receive their earned sales commissions. Mr. Eibeler also has experience as general counsel for a lawn and garden company who contracted with independent sales representatives throughout the world. Mr. Eibeler regularly appears before the Appeal Tribunal, Board of Review and Appellate Division representing persons in obtaining unemployment compensation claims after losing their job through no fault of their own. Mr. Eibeler has obtained favorable decisions for persons who were wrongfully denied their claims for unemployment benefits at all stages in the unemployment process. Mr. Eibeler has also assisted clients in holding former employers accountable for defaming former employees and tortiously interfering with their claim for unemployment benefits. 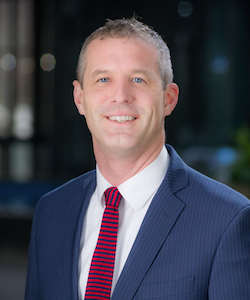 In addition to his litigation practice, Mr. Eibeler also provides clients with advice and counsel in employment contracts, severance agreements, restrictive covenants, non-compete clauses and employment negotiations. Mr. Eibeler also provides small businesses with advice and counsel concerning their own employment law related policies, including drug testing policies, anti-discrimination policies and drafting employment employee handbook. Mr. Eibeler speaks on issues concerning workplace harassment investigations and provides training to employees concerning anti-discrimination and anti-harassment. Obtained $4.2 million settlement on behalf of an employee who was constructive discharged from his employment after bullied and harassed based upon his perceived disability and sexual orientation. 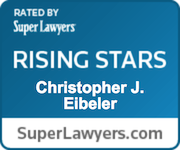 Mr. Eibeler was selected as Rising Star Super Lawyer in the area of employment law for the years 2013, 2014 and 2015. Mr. Eibeler is an avid Rutgers sports fan and operates the scoreboard for the Rutgers Football and Basketball teams.